???? - New Park - UPDATE - The project is on hold indefinitely as the company behind has states they are busy focusing on their clients and customer orders for new slides around the world, and had to put the plans to build the park on the backburner for the time being. (10/28/17) According to the park’s official website, they are planning on opening in Summer 2019. (11/30/12) ProSlide says that their plans to build the Alotta Water Park in Ottawa are still in the works... but also still on hold for the time being. According to this interview with the CEO, they are still planning the park out and intend on building it. However the target opening date has been pushed back several times, and was last thought to be opening in 2014, but that may still be pushed back one more year to 2015. 2018 - Nothing is known at this point in time, nothing new was known to be added in 2016 - 2017. 2018 - Funtana - (6/16/18) Calypso is adding a castle themed water sprayground called Funtana, featuring over 390 water jets and 65 interactive water games, including a giant chess board. I'm not sure how many kids the age attracted by this kind of attraction are avid chess players, but that's a discussion for another time. 2018 - High Noon Typhoon - (7/9/18) A quick note... the new High Noon Typhoon slide at CamelBeach is actually the former Liquid Lightning tornado slide from the closed Wildwater Kingdom waterpark that was located on the site of the former SeaWorld Ohio park. (7/7/18) A guest visiting the CamelBeach waterpark reported in that the park's new High Noon Typhoon slide is still under construction, but expected to open sometime in July. They don't offer a picture of what the slide will look like, but the website's description says it will feature a "Six Story Funnel", so I'm guessing this may be a Tornado style slide. The park currently does have Sand Storm, which features a pair of mini "tantrum" style funnel elements as well. 2018- New Park - Now Open - (1/18/18) A great review with photos and a video of the new Epic Waters indoor waterpark experience has been posted by OverTexasThrills this week. Check it out! (1/12/18) The nation's newest indoor waterpark will open in Texas today with the grand opening of Epic Waters in Grand Prairie. The 88,000 sqft waterpark is opening about a month later than expected due to construction delays. (10/6/17) According to the local news reports the Epic Waters Indoor Waterpark in Grand Prairie is set to open sometime in mid to late December. The city owned water park invited media in for a peek at the waterpark while under construction, as well as to watch a demonstration of the buildings massive retractable roof panels in action. (7/3/17) It's been awhile since we heard much more about the new Epic Waters indoor waterpark under construction in Grand Prairie, Texas, but according to the latest update from the park they are on track to open sometime in November 2017! Looks like a lot of fun for sure is heading to the greater Dallas area! Check out the official website here. 2019 - New Resort - (1/17/18) Great Wolf Lodge has announced that they will open a new indoor waterpark resort in Arizona near Scottsdale, opening sometime in the second half of 2019. The 350-room resort will be built next to Salt River Fields, the spring-training site for the Arizona Diamondbacks and Colorado Rockies baseball teams. 2017 - Rebranded Resort - (1/23/17) The Water Park of America resort attraction (and attached Radisson Hotel) located not too far away from the famous Mall of America in Minnestoa is reported to be in the final phases of a sale that would see it rebranded as a Great Wolf Lodge resort. Once the deal is complete they will perform some light rethemeing to give it the Great Wolf Lodge look as well as an expansion that will see new attractions like a ropes course, rock wall, bowling alley and more added. If they are able to stick to the timeline, the transformation and additions will be complete by November 2017. 2018 - New Resort - (2/1/18) According to the local news the new Great Wolf Lodge Georgia indoor waterpark resort is still on track to open on May 31, 2018. They claim that this newest resort project is being build as a new prototype Flagship Resort concept for the company moving forward, and will feature some brand new attraction concepts not seen at the other locations. There will be two new slide designs featured here from ProSlide. Triple Thunder - A group raft experience that will start off with a drop into a Tornado style funnel element and exit into a twisted layout that will feature two back-to-back saucer shaped elements followed by a few turns before the splashdown. Also new is Rapid Racer, a new two-lane racer concept that will feature enclosed 180º and 360º high speed turns, with drops and curves and three “rally points” where the racers can see and hear each other on the other side of a low separator wall. Other attractions popular at other locations included here include: For Mackenzie (play structure), Totem Towers body slides, Wolf Tail (Drop Pod slide), Otter Run, Slap Tail Pond (wave pool), Chinook Cove, Big Foot Pass (water obstacle challege), Crooked Creek (lazy river), Cub Paw Pool (kiddie area) and Whooping Hollow (play area for smaller kids). (1/25/17) A new Great Wolf Lodge is coming to Georgia after all... just not in Peachtree City. Following the complaints it seems the city held a public vote with went against the Great Wolf Lodge proposal. This has all worked out to the benefit of LaGrange, GA, a short drive south down I-85 from there, about an hour's drive away from Atlanta. A brand new Great Wolf Lodge Resort will soon begin construction in LaGrange (off exit 13) with a planned opening date of 2018. The new Lodge has already been confirmed with an official webpage on the company site as well which you can see here along with a brief animation video showing off the planned look of the new resort. 2018 - Rebranded Resort - (3/8/18) With the opening of the new Great Wolf Lodge in Gurnee set for July 1st, a reader sent in a quick picture of the rebranded resort as seen from the highway today. You can see the finished exterior painting is now complete, a paw logo up on the building and crews working to finish installing the new giant enclosed waterslides being added. (2/9/18) The new Great Wolf Lodge near Six Flags Great America built from a closed Key Lime Cove Resort, is slated to reopen the doors and let the wolf howl starting July 1st with a new indoor waterpark twice the size of the old Key Lime Cove one. (2/10/17) According to the local news a deal is now in place for Great Wolf Lodge to take over the Key Lime Cove indoor waterpark resort in Gurnee, IL and transform it into a new Great Wolf Lodge location. According to estimates, Great Wolf will end up paying the city $150,000 more per year in hotel/resort taxes than it currently gets from Key Lime, and to help things along the board will enter a tax-sharing agreement with Great Wolf. If the deal is finalized Key Lime will likely close this spring to allow for Great Wolf to renovate the resort and waterpark over the next year in order to open the rebranded resort in Spring 2018. ???? - New Resort - (8/14/18) The local news reports that a second Great Wolf Lodge is coming to California, this time in the Northern half of the state in Manteca (South of Sacramento, East of San Francisco). They hope to begin construction on the new waterpark resort before the end of the year that will feature a 95,000 sqft indoor waterpark area, 500 rooms, plus a 45,000 sqft family entertainment center that will offer a ropes course, mini-golf and the MagiQuest interactive game system installed throughout the resort. ???? - New Resort - Planning - (9/1/18) Great Wolf Lodge is in talks to build their first resort in New York, a new location about 90 minutes away from their Pocono's location, but this one will be in Orange County, about 8 miles away from where the new LEGOLAND New York park is being built in Goshen. The creation of the new Legoland park was likely the main drive behind this new location, as they are looking over a couple of site in the area, one that is county-owned property. If they opt to go ahead with this, look for construction to start within the year, as the project will likely be fast-tracked by Great Wolf. Typically construction time on these is around 18 months or so, so look for it to open as early as 2021. 2019 - New Slides Planned - (2/18/18) The local news reports that the new H2OBX waterpark had a good enough first season last year that they are already working on plans to add new attractions for the 2019 season. Long term, the developers say that they would also love to see new retail, restaurants and even hotels added to the property nearby the park. Translation... "We built the park in the middle of nowhere" where even the closest gas station is a mile and a half away in one direction and almost 3 miles in the other and major food options appear to be even further out at the moment. But then again, I think that describes much of the OBX region in general... long stretches of rural nothingness with the occasional oasis of modern commercialism scattered here and there, but mostly near the beaches. So it should be interesting to see if H2OBX serves as the anchor-point for a bit more future development, or for other attractions that could prove to be popular with tourists during the rest of the year when the waterpark is closed. 2018 - Nothing is known at this time but after opening a HUGE expansion in 2017, they may not add anything this year. Late 2019 - Convention Center Expansion - (6/28/18) Kalahari reports that they have broken ground on an expansion to their convention center at the Proconos resort. The expansion will add two new ballrooms and 18 new meeting rooms when it opens in late 2019. Park News - (3/13/18) A major incident took place at the Kalahari indoor waterpark resort on Monday when one of the large air ducts attached to the ceiling inside the waterpark near the wave pool fell from the mounts, landing into parts of the kiddie and wave pools and attached pathway between them. I've seen two different reports so far, one claiming there were five people injured when it fell and another claiming it may have been as high as seven. Pictures from the scene aren't too hard to find posted across social media (see below) but soon after the incident, Kalahari closed the waterparks, removed all guests and covered all the windows with views into the waterpark. Winter 2017 - Storm Chaser - (11/21/17) The new Storm Chaser Slideboarding Adventure attraction at the Kalahari Resort in Ohio is now open and adds the concept of an interactive game experience to a waterslide attraction. (7/24/17) The Kalahari indoor waterpark resort in Sandusky, Ohio will be adding a new slide to the park that is slated to open Winter 2017. They call it Storm Chaser and according to the description posted at the park, it will feature an interactive video game style feature to create a "Slideboarding Adventure". Using a custom tracking system it will recognize individual riders and track your score and progress down the slide throughout the day, even allowing you to unlock new levels of game-play. 2018 - Bugs' Burrow - (2/18/18) According to a post on Twitter the Kalahari Sandusky indoor waterpark resort is adding a new outdoor kids slide area to be called Bugs' Burrow, set to open Memorial Day weekend 2018. 2020 - NEW RESORT - Confirmed - (5/16/18) Kalahari Resorts has broken ground on their next mega indoor waterpark resort, this time in Round Rock, Texas. This will be their forth resort property and it is slated to open in 2020, making this Kalahari's first expansion into the Southwest. The new resort will feature nearly 1,000 rooms, a convention center, Tom Foolery's Adventure Park, dining, a full-service spa, shopping and more, all in addition to the waterpark fun Kalahari is known for. A few other factoids: this will be America's Largest Indoor Waterpark at 223,000 sqft, and the Tom Foolery's Adventure Park will feature over 80,000 sqft of rides, ropes courses, climbing walls, ziplines, bowling, laser tag, mini-golf and more. (6/16/16) Kalahari Resorts and Conventions' founder announced that they are looking into building the company's forth waterpark resort property in Round Rock, Texas. This would become their forth resort property and the first in the south-west. The African themed resort would have up to 1,000 rooms and both indoor and outdoor waterpark sections, on-site restaurants, an entertainment center, spa and convention center. No timeline was mentioned, but Round Rock is about 15-20 miles north of Austin, TX, and looks to be about 10-15 miles away from Cedar Park, TX where Schlitterbahn once proposed to build their own new waterpark and convention center, but has since let that project fall into limbo. 2019 - New Resort - (1/17/18) The owners of the Camelback Resort are now building their next new project: The Kartrite Hotel & Indoor Waterpark. The new resort is planned to open in early 2019 in the Resorts World Catskills resort area in New York and will feature 324 guest suites and two-acres of indoor waterpark space. The waterpark is being designed by Aquatic Development Group and is inspired by the architecture of the indoor waterparks in Europe and will feature a barrel-shaped transparent Texlon roof that will allow sunlight inside year-round. Not only does this allow year-round sunbathing, but will also allow for the planned tropical plants inside to thrive and create a unique indoor environment not seen at any other indoor waterpark in the US. As for the name... The Kartrite is named after the explorer character, Kartrite Van Der Berris, first created and introduced at the Camelback resort property. The teaser website for the new resort is also live at TheKartrite.com. 2019 - The Coaster Formerly Known as Kanonen - Purchased - (7/23/18) Ok, I was shocked when it was announced that Lost Island bought Kanonen... but now I'm even more shocked. When questioned about it on social media, the park responded that they had no plans to install the coaster at Lost Island at this time, and instead were hoping to sell it off to a new owner by next year. This of course begs the question, "Why did you buy it in the first place?!?!" The answer may be an easy one, one that answers all the questions I had about why a small waterpark in Iowa would buy it in the first place, because beyond the huge cost of installing it in the first place, chances are the annual maintenance budget required to run and maintain an Intamin Accelerator could very well be higher than the rest of their entire annual maintenance cost for the entire park. This may simply be a case of them buying something because they got a good deal... only to realize they bit off more than they could chew with it and are now hoping to recover their costs by reselling it. Either way... the Kanonen saga is far from over. Somewhere out there could be a park willing to buy it, though it seems like the two chains with the most experience with this kind of Intamin creation (Cedar Fair and Merlin Entertainment) both likely passed on it the first time it was for sale. Plus there is some competition in the marketplace too as Zaturn from Japan is also up for grabs. (7/21/18) Consider me surprised... but according to First Drop Magazine the former Kanonen launched coaster (Intamin) that was removed and sold from Liseberg is coming to the USA... to a waterpark... in Iowa. Look for it to open in 2019 at The Lost Island, though instead of in the waterpark itself I'd assume we'll see the coaster go up in the other section of the attraction that features Mini-Golf and Go-Karts as a pay-per-ride attraction. For those who have only focused on US rides thus far, Kanonen was an Intamin Accelerator coaster that uses Intamin's hydraulic launch system to send trains at 46.6 mph around a compact 1,443 ft track up a 78 ft top hat and through two inversions (vertical loop and barrel-roll). Park News - (12/12/18) Six Flags Great America reports that they have received the final approval needed to begin operations of the Magic Waters waterpark property in Rockford, IL. With this in place the new leasing agreement for the waterpark will begin on April 1, 2019. The details were not clear, but they also mentioned some kind of 2-park combo pass option is now being sold that would include Six Flags Great America and Magic Waters, which seems to indicate that a standard Six Flags season pass will not automatically be accepted at Magic Waters. For confirmation and to see what needs to be done, please check with Six Flags Great America who are advertising that guests who buy a season pass before Christmas will get an free upgrade to the 2-park combo pass option. (10/11/18) In an interesting announcement, Six Flags is signing a deal with the Rockford Park District to lease and operate the Magic Waters Waterpark starting in Spring 2019. This is a 43-acre waterpark located in Rockford, Illinois (just West of Chicago) that has been owned and operated by the local park district since 1988. This also means that the Six Flags Gold Season Passes that offer admission to Six Flags Great America and Hurricane Harbor will also work at Magic Waters. (6/14/18) According to the local news the Magic Waters waterpark in Rockford, IL could find itself under new ownership. The park is owned by the Rockford Park District, but according to the report someone else has quietly approached the city to inquire about buying or leasing the Magic Waters waterpark from them. No decision has been made yet, but it makes me wonder who may be trying to buy it. Could it be Six Flags? Premier Parks? Or is EPR Properties looking to gobble up another small park to add to their portfolio? ???? - Boomerango - Planned - (6/16/16) According to a report from the local news, after the MasterBlaster slide was removed from the Magic Waters waterpark the District approved a new AquaLoop slide to replace it in 2017. However, if you look at the artwork on the page, it appears they have already designed a phase 2 attraction to follow it, labeled as a Boomerango slide placed right next to the Aqualoop. 2018 - Nothing is known at this time, nothing was known to be added in 2016 - 2017. (6/16/18) Wouldn't you know it... as soon as I spoke of delays... we get a good sign of progress. That said, apparently Raja at Noah's Ark had a season passholder preview of the new slide early this morning. No word on if it opened to the public afterwards or not, or if there is still work to be done before it can open. (6/14/18) Sounds like the new Raja attraction at Noah's Ark may be delayed a bit from the previously promoted mid-June opening timeline. According to a reader who visited the park, construction crews were still pouring concrete on the site as of this week, so it may be a few more weeks until it is ready. (4/10/18) A reader sent in a couple of new photos from Noah's Ark where the new slide pieces from Polin have arrived and we get a look at the construction area for the future world's largest King Cobra slide. (11/29/17) Noah's Ark has announced they will be adding "Raja - The World's Largest King Cobra" in 2018, a new snake themed slide from Polin, similar to the King Cobra slide built for Six Flags Hurricane Harbor in New Jersey. According to the park it will be the longest and tallest slide of it's kind, standing 6-stories tall and 335 feet long and be placed next to the Flash Flood ride. (8/21/17) So far the early word is that Noah's Ark is expecting to add a new attraction near the Flash Flood ride for 2018, but no one is sure what. In addition, we've heard that there may be a plan to refurbish the park's mini-golf course as well. (8/14/17) A guest to Noah's Ark this week reports that the park has put up construction walls near Flash Flood and the park's Shoot the Chutes ride. They also noticed that some land clearing looked like it had begun in that area, along with the removal of some trees. Any idea what may be going in for next year? 2019 - Safari Adventure Mini Golf - (1/22/19) Noah’s Ark confirmed that they will be opening a new Safari Adventure Mini Golf course in 2019, just in time for the park’s 40th anniversary. A game of 18-holes will cost $5.95, and passholders will get a discount. 2018 - Family Raft Slide - Planning - (10/6/17) Ocean Breeze has announced they will open a new, yet to be named, proslide Mammoth family raft ride for the 2018 season. While they are still working on the right name, they did reveal that the ride will feature a red, white and blue patriotic theme and color scheme. Look for it to be located over the existing Jungle Falls attraction. 2018 - Nothing is known at this time, nothing was known to be added in 2015 - 2017. 2018 - Nothing is known at this time, nothing was added for 2017. Schlitterbahn Waterparks - These parks are so awesome, they deserve their own designated page. CLICK HERE. 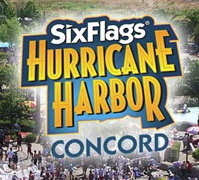 Park News - (2/24/18) Six Flags has announced that the Waterworld California waterpark is being renamed starting this year as Six Flags Hurricane Harbor Concord. Look for the re-branded waterpark to open for the season on May 5th. 2018 - Splashwater Island - (8/31/17) A new interactive water treehouse / fortress attraction is coming to the park for 2018 with slides, geysers and a giant tipping bucket. 2019 - Caribbean Cove - (8/30/18) The waterpark will add a new kids play area called Caribbean Cove for 2019, made just for them. Park News - (2/13/19) With Six Flags now in control of the Wet ‘n’ Wild Phoenix waterpark, they announced they will rebrand it as Six Flags Hurricane Harbor Phoenix this season. To go along with the new Hurricane Harbor name, look for some new tropical theming to also be added to the park along with other internal improvements. 2019 - Wahoo Wave - (2/13/19) With Six Flags now in control of the Wet ‘n’ Wild Splashtown waterpark in Houston, they announced the park will be renamed this season as Six Flags Hurricane Harbor Splashtown. To go along with the new Hurricane Harbor name, look for some new tropical theming to also be added to the park along with a new waterslide named Wahoo Wave. Wahoo Wave will take a family sized raft and send it through an enclosed tube before plunging it down into a half-pipe style element before going back into a tunnel briefly before hitting the splash down at the bottom. 2018 - Riptide Racer & Bombs Away - (12/20/17) The Splish Splash waterpark in New York will be adding two new attractions that will be ready to open for Memorial Day Weekend 2018. Riptide Racer, a new four-lane mat-racer slide and Bombs Away, a new enclosed blody slide that starts off the excitement by loading you into a drop-pod at the top of the platform. To see more check out the preview video below. 2018 - Nothing is known at this time, nothing was known to be added between 2013 - 2017. Waterworld California (Concord, CA) has become Six Flags Hurricane Harbor Concord. All information moved here. 2018 - Nothing is known at this time, nothing was known to be added between 2016 - 2017. Park News - (1/12/19) Will the Wet ‘n’ Wild park in Palm Springs soon have a new owner? At the very least we know it will have a new operator as Premier Parks, LLC has confirmed that they are no longer managing the small waterpark for owner, EPR Properties in 2019. Meanwhile Six Flags has been not only looking to expand their footprint in the US by taking over small parks, but they are also already operating two other Wet ‘n’ Wild branded waterparks for EPR Properties: Wet ‘n’ Wild Splashtown in the Houston, TX area and Wet ‘n’ Wild Phoenix in Arizona. I’d expect an official announcement to take place regarding the park’s future in the very near future. 2018 - Nothing is known at this time, nothing was known to be added between 2015 - 2017. 2020 - New Park - Proposed - (4/10/19) The plan to build a new Wild Rivers is back in action once again, and while they will miss the previously announced 2019 opening date, they are back with a bigger and better plan to build a new $50 million waterpark expected to open in May 2020 that will be 50% bigger than the original park that closed in Irvine back in 2011. They even plan to rebuild the park’s famous Bombay Blasters slides along with a mix of new modern waterslide attractions, including an uphill water coaster attraction. Follow the link to read up on the latest details in the effort to bring this famous SoCal waterpark experience back to life. (4/4/18) Our friends at BlooLoop report that the plans to open an all new Wild Rivers waterpark should come together in time to open the park by Summer 2019 if all goes well. Details about the current status of the project along with all new concept art of the waterpark can be found by following the link. (7/1/17) A quick update about the status of the new proposed Wild Rivers waterpark in Irvine can be found over at BlooLoop, where the 30-acre park could be up and running as early as Summer 2019 if everything goes smoothly. For the moment, a preliminary site plan must be submitted along with the drafting of a new land-lease for the park. (5/4/17) After years and years of delays to the point where I think most people had forgotten all about it, finally this week there is light at the end of the tunnel and the former Wild Rivers waterpark from Irvine may live again as part of The Great Park project. The Irvine City Council, acting as the Orange County Great Park board directed their staff to begin negotiations with Wild Rivers officials to build and operate a new waterpark. The original Wild Rivers waterpark in Irvine closed down in 2011 after a 25-year successful run when their land lease ran out and the land owners did not want to sign a new one. According to the OCRegister, the new park would take up a 30-acre site and feature many waterslides, including an uphill water-coaster style slide, wave pools, lazy rivers and a rebirth of the old park's popular Congo River Rapids. They claim the park would cost $50 million to build and that they have already secured $40 million in financing. 2018 - Nothing is known at this time, nothing new added in 2017. Check out the Screamscape review of the awesome Wilderness at the Smokies Hotel & Waterpark Resort. 2018 - Otter Banks / Blue SandPiper Splash - (6/16/18) Zoombezi Bay is adding a new area called Otter Banks that will feature some themed pools, rentable cabanas and a pair of "drop" slides called Blue SandPiper Splash that end with the slider way high in the air, before they drop into a 10 foot deep pool. 2019 - New Sea Lion Exhibit - (6/19/17) I'm told that the Columbus Zoo announced they would be adding a new exhibit for Sea Lions and Harbor Seals for 2019, with the Sea Lions expected to be coming in from the Ocean World park in China.